In 1941 Pearl Harbour became the scene of a devasting surprise attack by Japanese forces. After decades of being on the edge of war with Japan, the attack pushed the US to join World War II. Not only did this attack took thousands of lives but also triggered racial prejudices towards Japanese-Americans which led to mass ‘evacuation’ of around 1200,000 people. On February 19, 1942, just a couple months after the attack, President Franklin D. Roosevelt signed Executive Order to deport and incarcerate all Japanese-Americans. Thousands of people, many of whom were born in the US, were forced to abandon their houses, businesses, farms, and possessions. They were loaded into busses with only as many things as they can carry with no knowledge of where they’re going and how long they’re staying there. A photographer Dorothea Lange who is probably best known for her photo titled Migrant Mother was hired by the US government to document the evacuation. The photographer perfectly captured the devastating moments of Japanese-Americans leaving their old lives behind and entering into the unknown. However, the military wasn’t happy with Lange’s opposing opinion of the internment camps. The photographs were seized from her and only made public in 2006. Today we finally have the opportunity to look back at this particular moment in history and see for our selves how the lives of Japanese-Americans were changed forever. The full caption for this photograph reads: Manzanar Relocation Center, Manzanar, California. Third grade students working on their arithmetic lesson at this first volunteer elementary school. School equipment was not yet available at the time this photograph was taken. The full caption for this photograph reads: San Francisco, California. 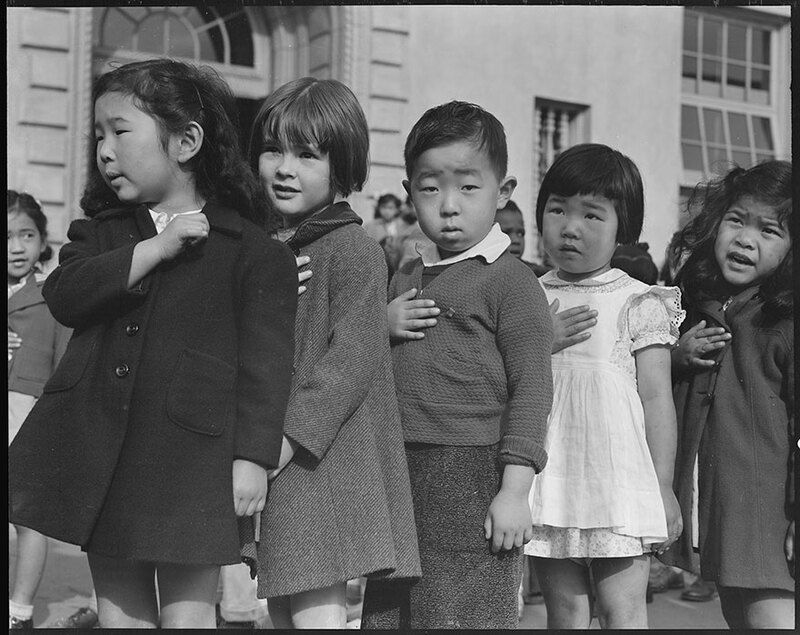 Many children of Japanese ancestry attended Raphael Weill public School, Geary and Buchanan Streets, prior to evacuation. 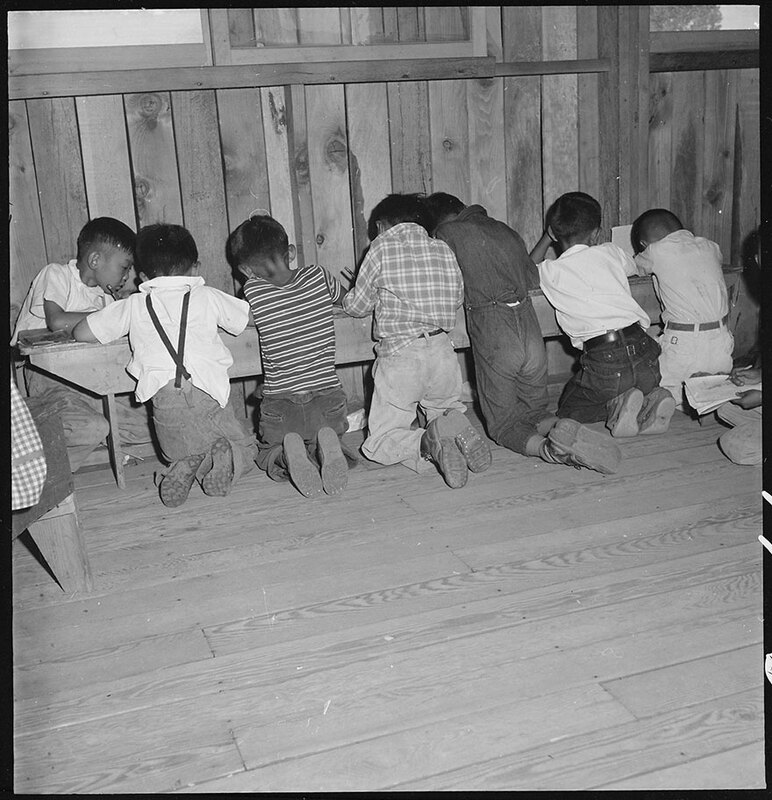 This scene shows first- graders during flag pledge ceremony. 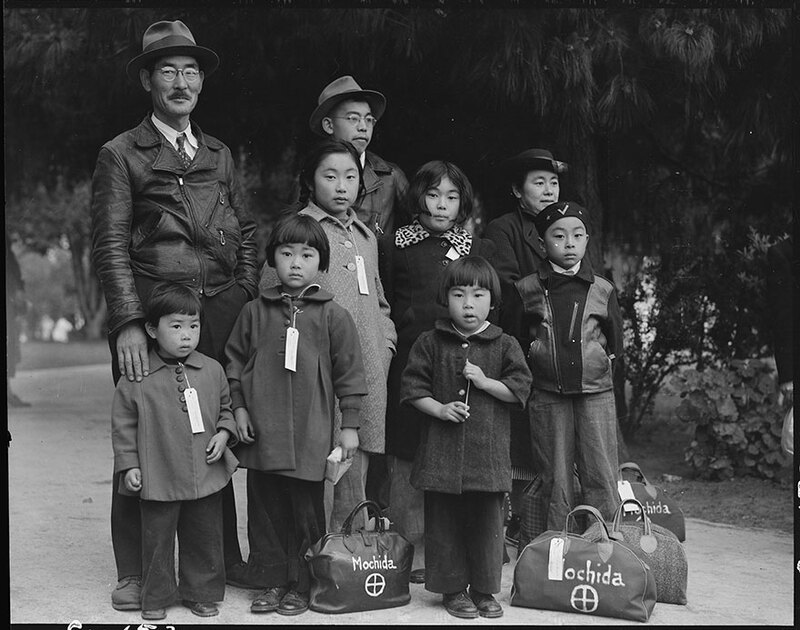 Evacuees of Japanese ancestry will be housed in War Relocation Authority centers for the duration. Provision will be effected for the continuance of education. The full caption for this photograph reads: Hayward, California. 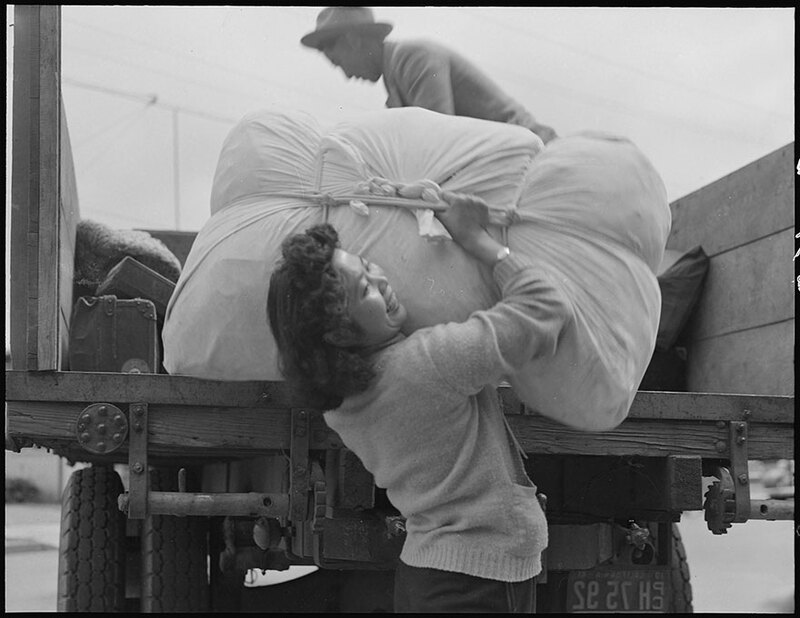 A farm girl helps unload family baggage in a final step before evacuation. 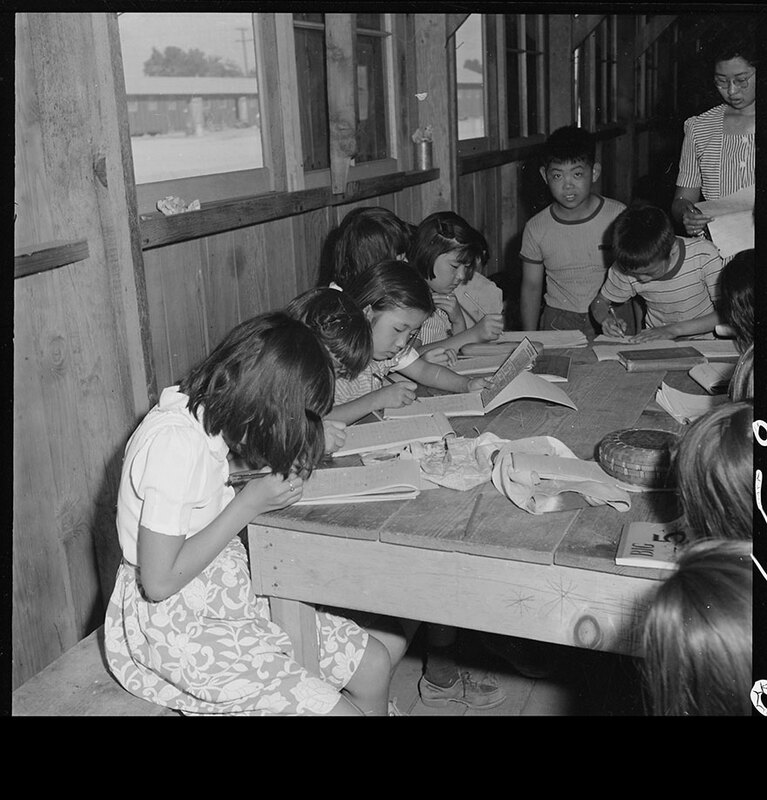 Evacuees of Japanese ancestry will be housed in War Relocation Authority centers for the duration. The full caption for this photograph reads: Manzanar Relocation Center, Manzanar, California. 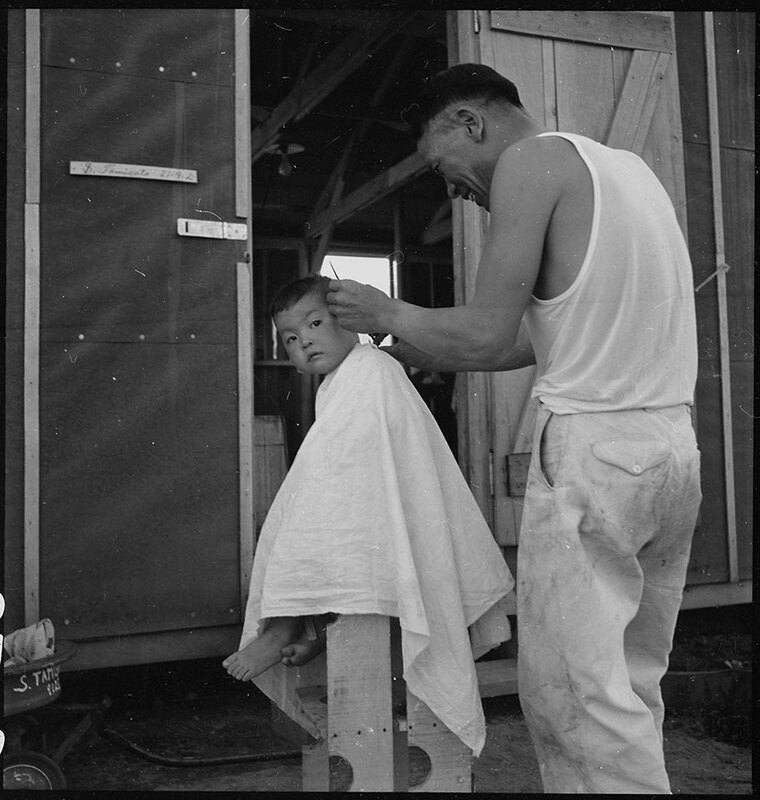 Grandfather and grandson of Japanese ancestry at this War Relocation Authority center. The full caption for this photograph reads: Centerville, California. This youngster is awaiting evacuation bus. 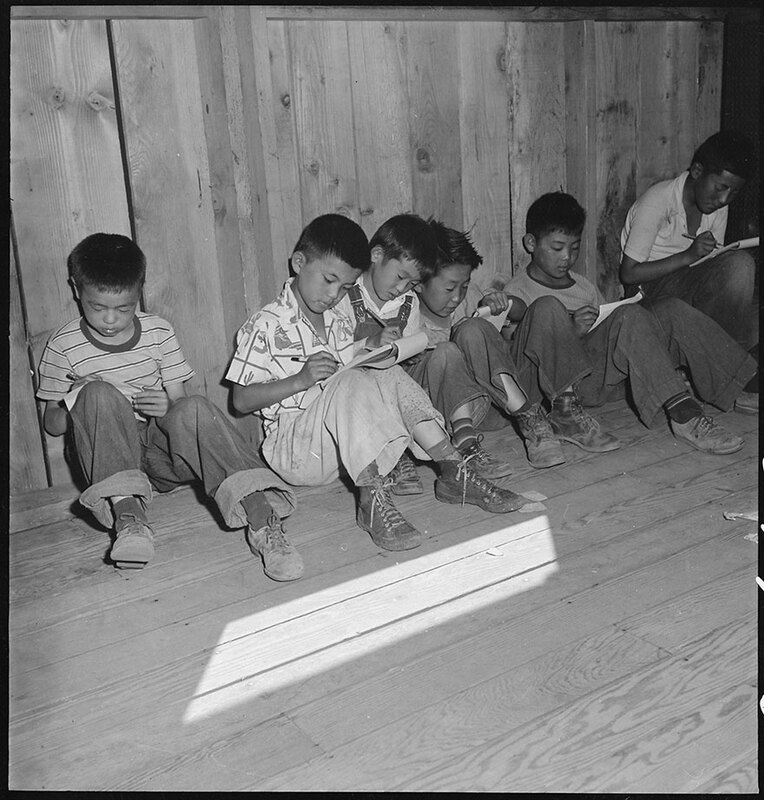 Evacuees of Japanese ancestry will be housed in War Relocation Authority centers for the duration. 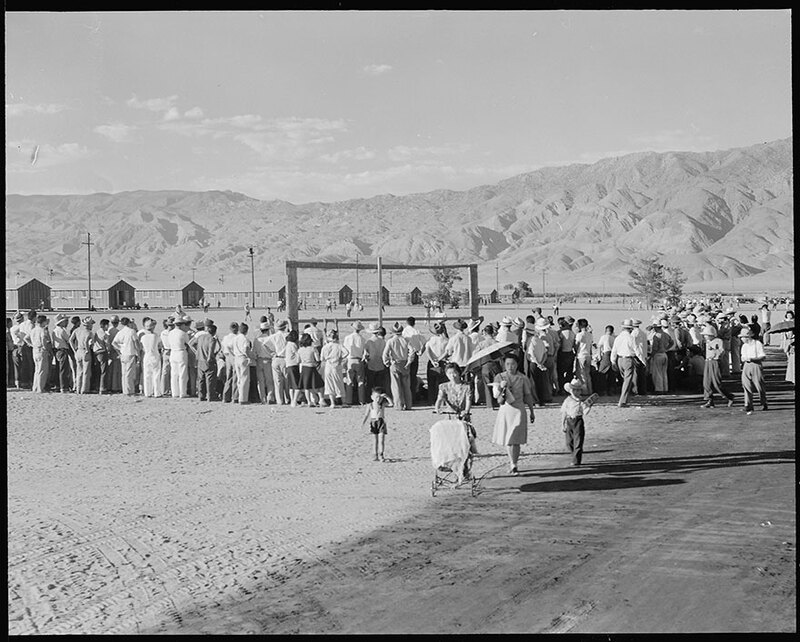 The full caption for this photograph reads: Manzanar Relocation Center, Manzanar, California. 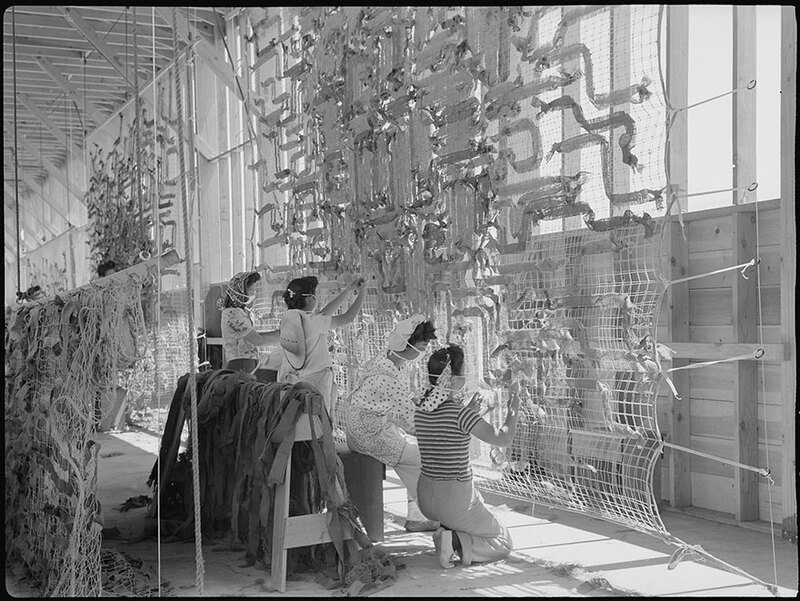 Making camouflage nets for the War Department. 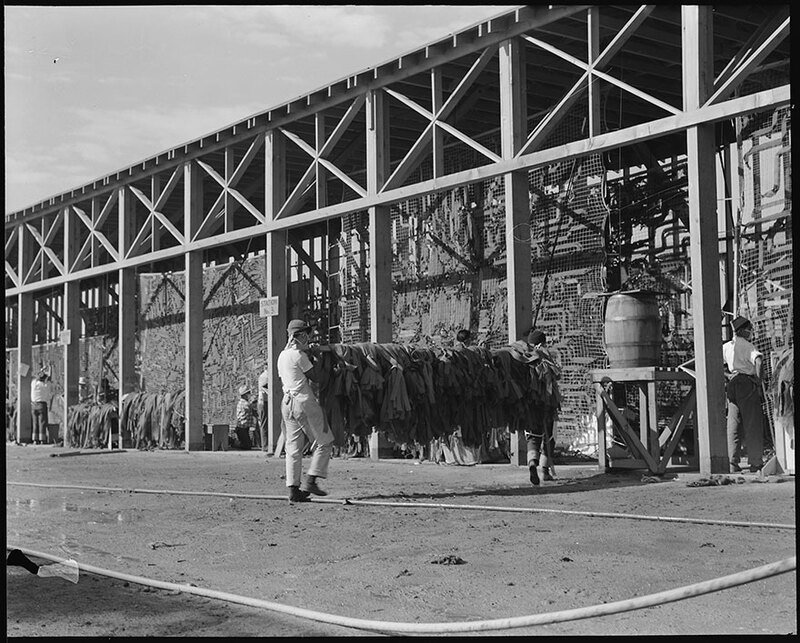 This is one of several War and Navy Department projects carried on by persons of Japanese ancestry in relocation centers. The full caption for this photograph reads: Manzanar Relocation Center, Manzanar, California. An elementary school with voluntary attendance has been established with volunteer teachers, most of whom are college graduates. These young evacuees are eager to learn and do not mind the lack of equipment. 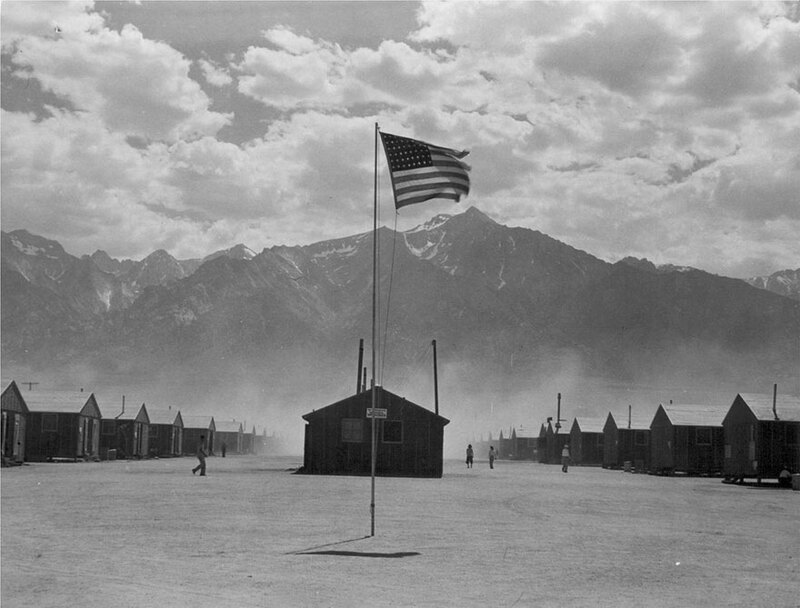 The full caption for this photograph reads: Manzanar Relocation Center, Manzanar, California. 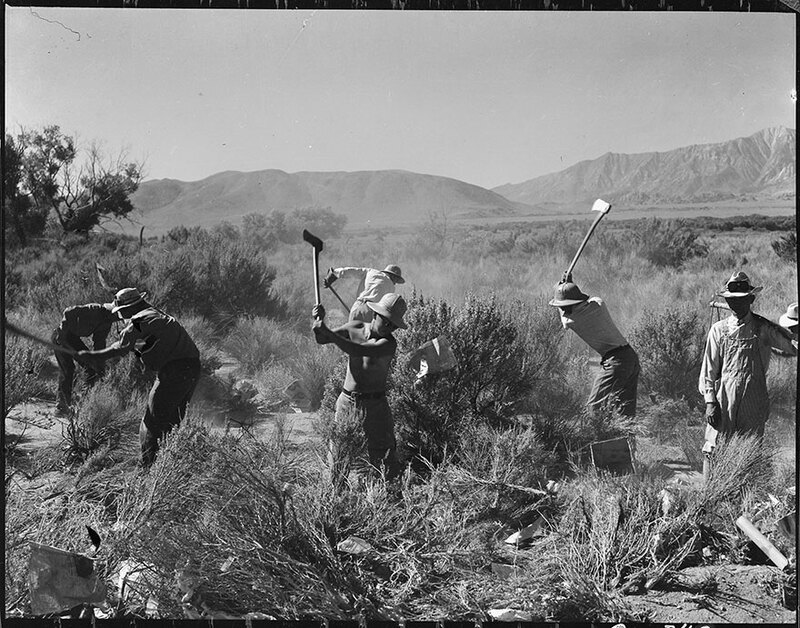 More land is being cleared of sage-brush at the southern end of the project at this War Relocation Authority center for evacuees of Japanese ancestry. Scene of barrack homes at this War Relocation Authority Center for evacuees of Japanese ancestry. A hot windstorm brings dust from the surrounding desert. 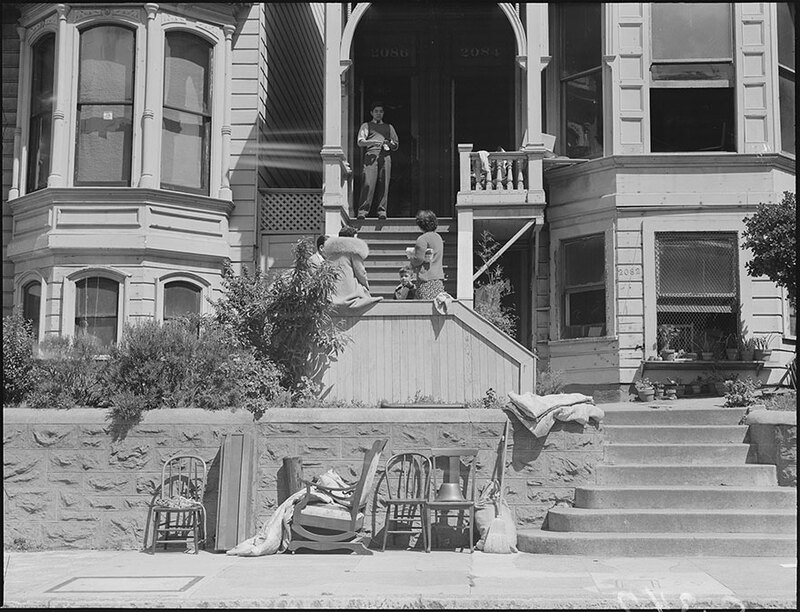 The full caption for this photograph reads: San Fransico, California. Street scene in Japanese quarter on day preceding evacuation to assembly center. Their household effects will be stored. 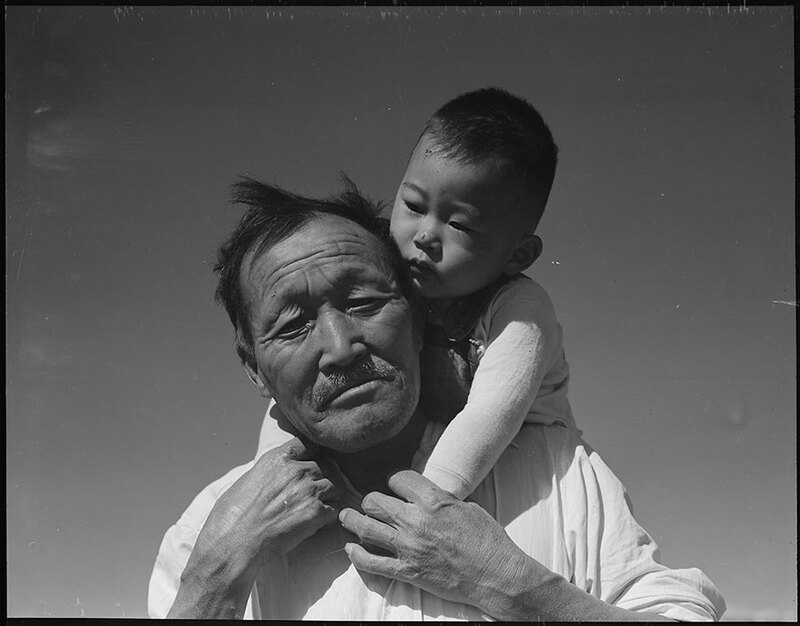 The full caption for this photograph reads: Manzanar Relocation Center, Manzanar, California. A typical interior scene in one of the barrack apartments at this center. Note the cloth partition which lends a small amount of privacy. The full caption for this photograph reads: Manzanar Relocation Center, Manzanar, California. 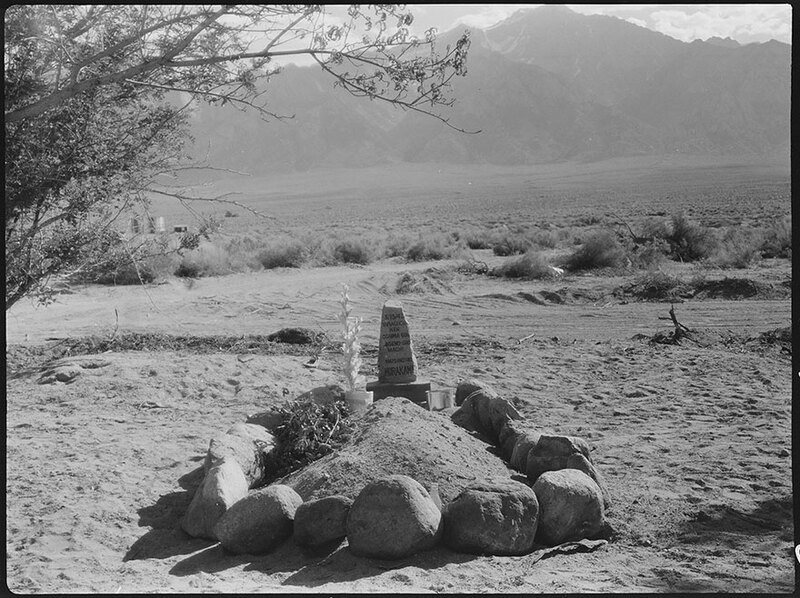 The first grave at the Manzanar Center’s cemetery. It is that of Matsunosuke Murakami, 62, who died of heart disease on May 16. He had been ill ever since he arrived here with the first contingent and had been confined to the hospital since March 23. The full caption for this photograph reads: Manzanar Relocation Center, Manzanar, California. 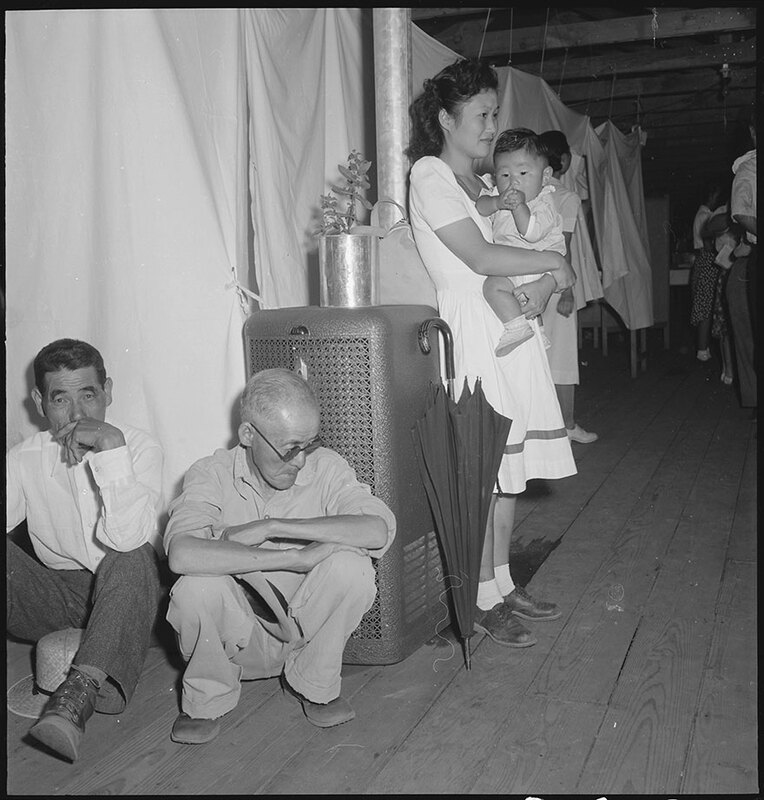 Evacuees watching a baseball game at this War Relocation Authority center. This is a very popular recreation with 80 teams having been formed throughout the Center. Most of the playing is done between the blocks of barracks in the firebreak space. 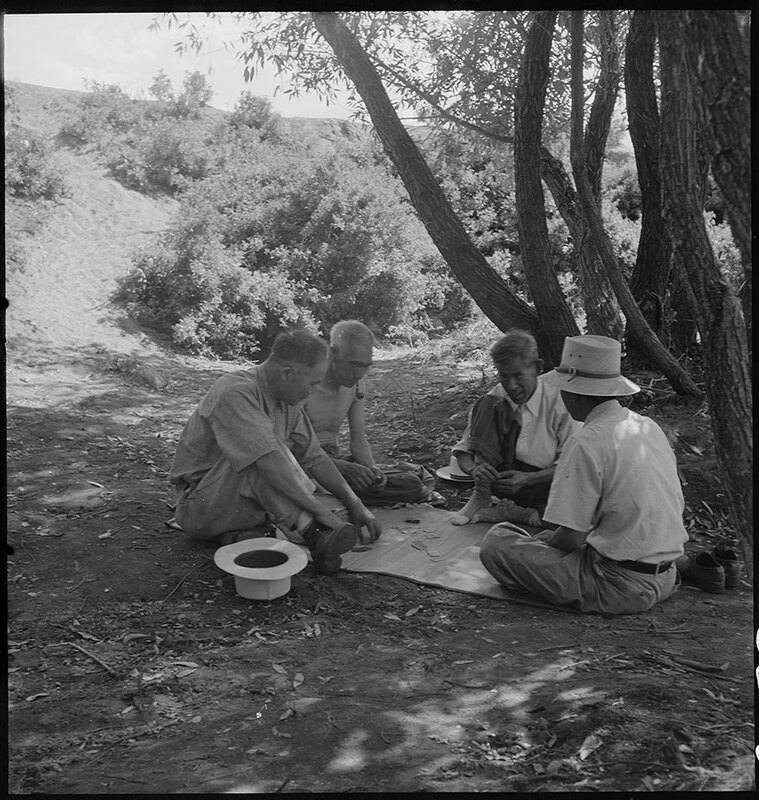 The full caption for this photograph reads: Manzanar Relocation Center, Manzanar, California. 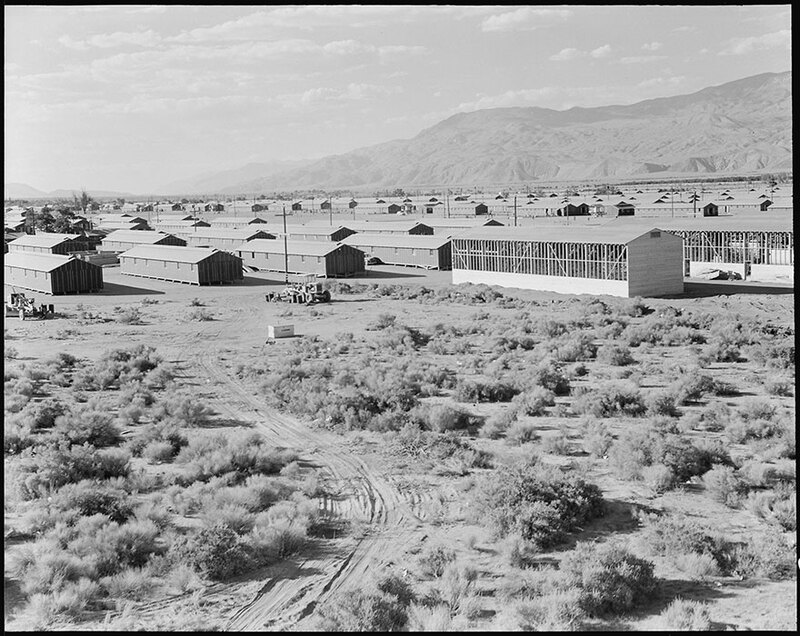 View of the Manzanar Relocation Center showing the buildings (right) where camouflage nets are made. The full caption for this photograph reads: Manzanar Relocation Center, Manzanar, California. 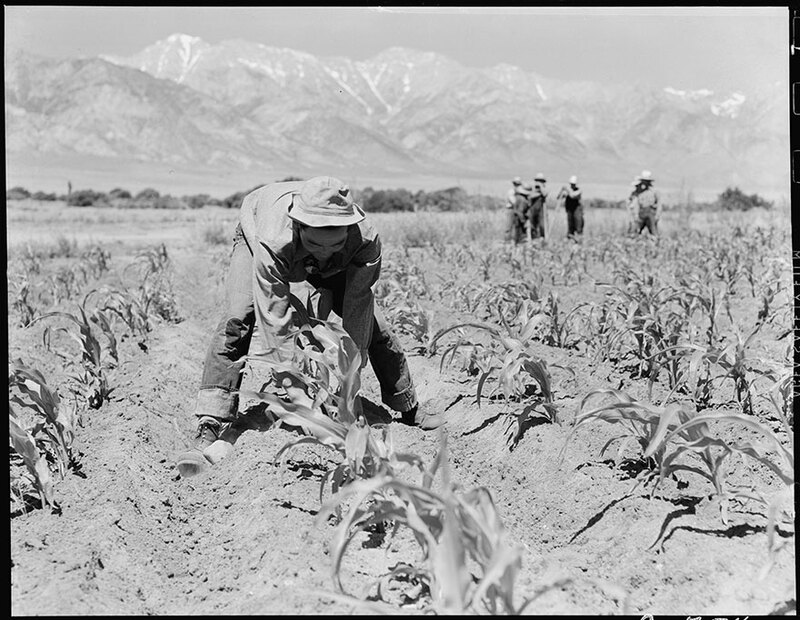 Johnny Fukazawa, evcauee of Japanese ancestry at this War Relocation Authority center, weeding corn in the farm project. The full caption for this photograph reads: Manzanar Relocation Center, Manzanar, California. 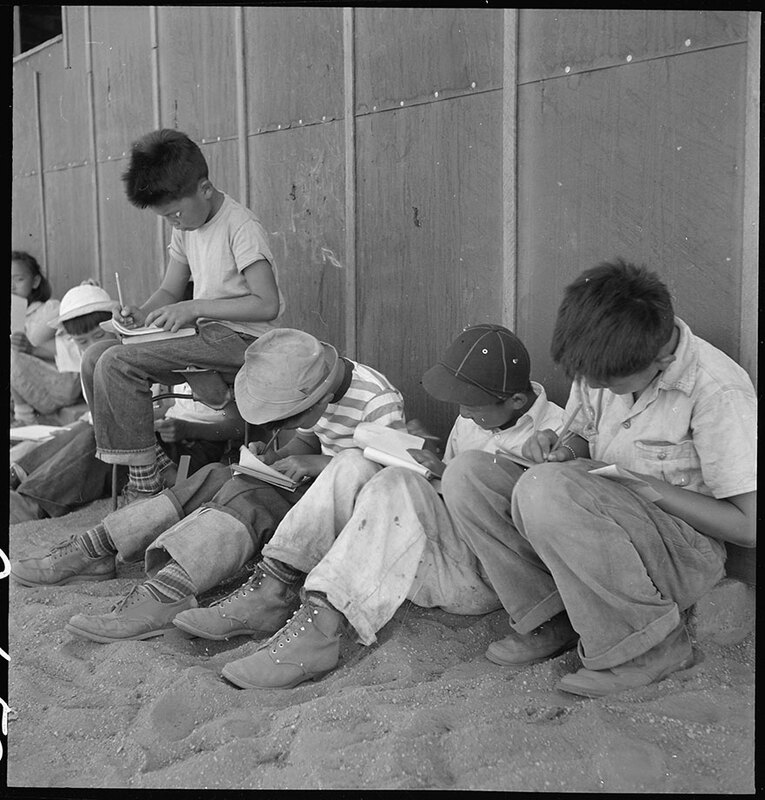 Young sixth-grade students studying their lessons in the shade of the barracks at this first voluntary elementary school. The full caption for this photograph reads: Manzanar Relocation Center, Manzanar, California. 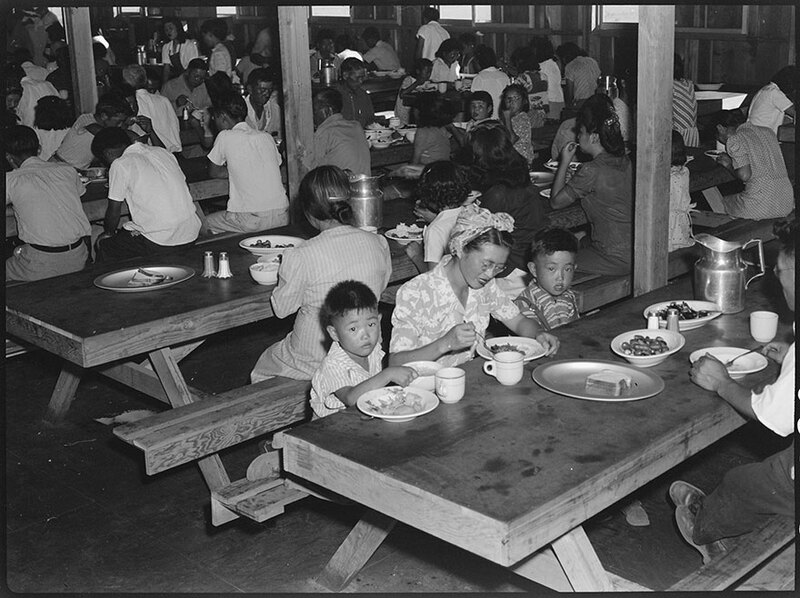 Mealtime in one of the messhalls at this War Relocation Authority center for evacuees of Japanese ancestry. The full caption for this photograph reads: Manzanar Relocation Center, Manzanar, California. 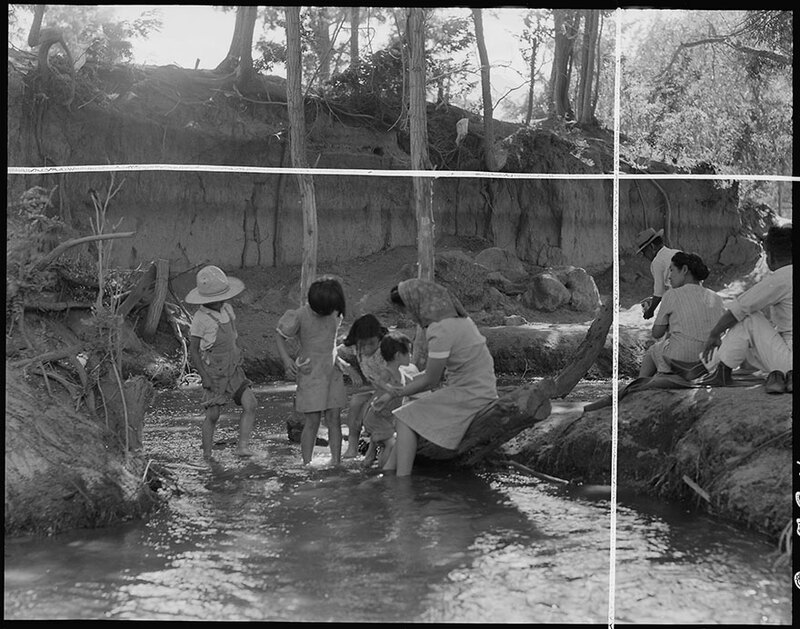 Evacuees enjoying games under the shade of trees near the creek which flows through the desert on the border of this War Relocation Authrority center. The full caption for this photograph reads: Manzanar Relocation Center, Manzanar, California. 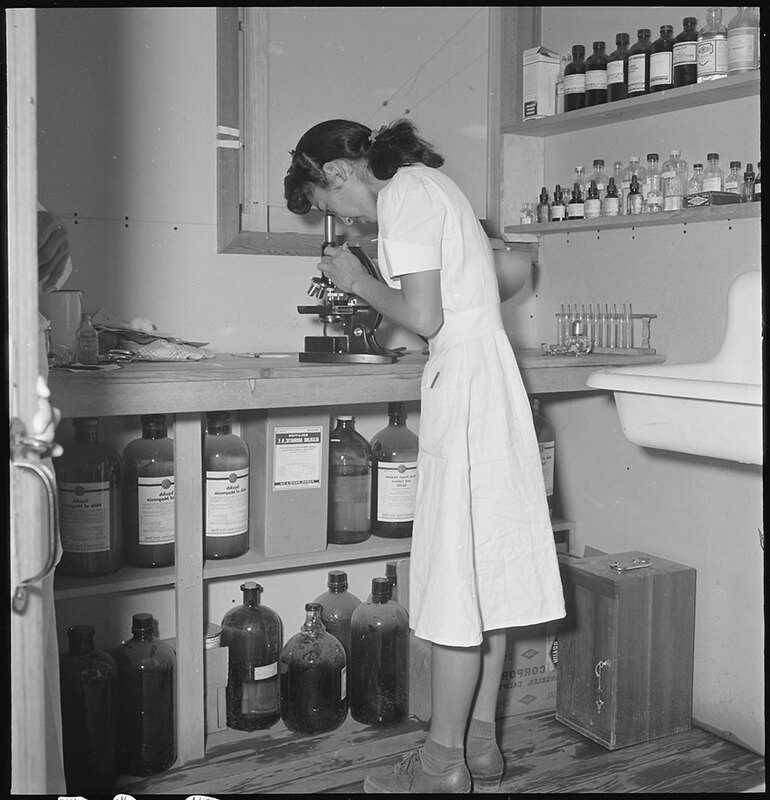 Mary Uyesato, trained laboratory assistant at work in the medical center at this War Relocation Authority Center for evacuees of Japanese ancestry. The full caption for this photograph reads: Manzanar Relocation Center, Manzanar, California. 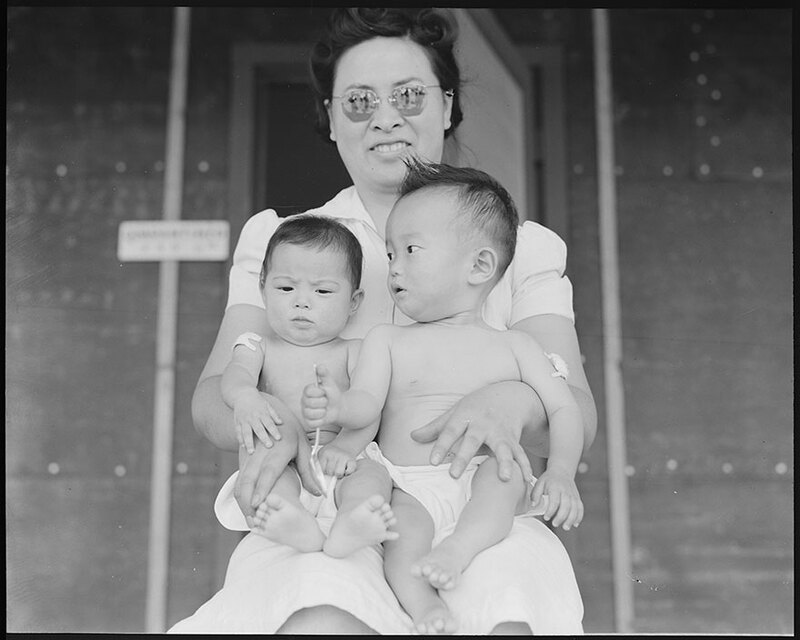 The two youngest of the 65 evacuee orphans in the Childrens’ Village at this War Relocation Authrority center for evacuees of Japanese ancestry. The full caption for this photograph reads: Sacramento, California. 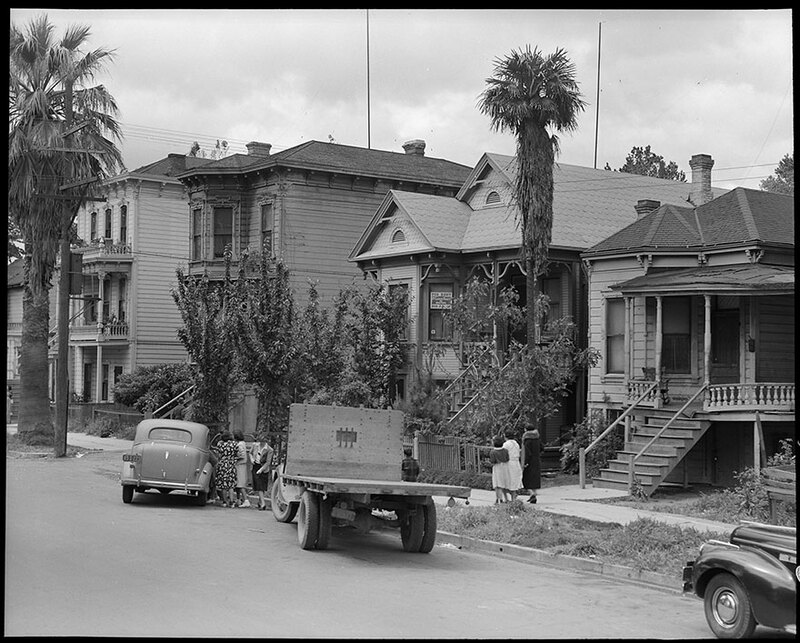 Typical homes of residents of Japanese ancestry. Evacuation to assembly centers is due in a few days and preparations are now under way. The full caption for this photograph reads: Manzanar Relocation Center, Manzanar, California. 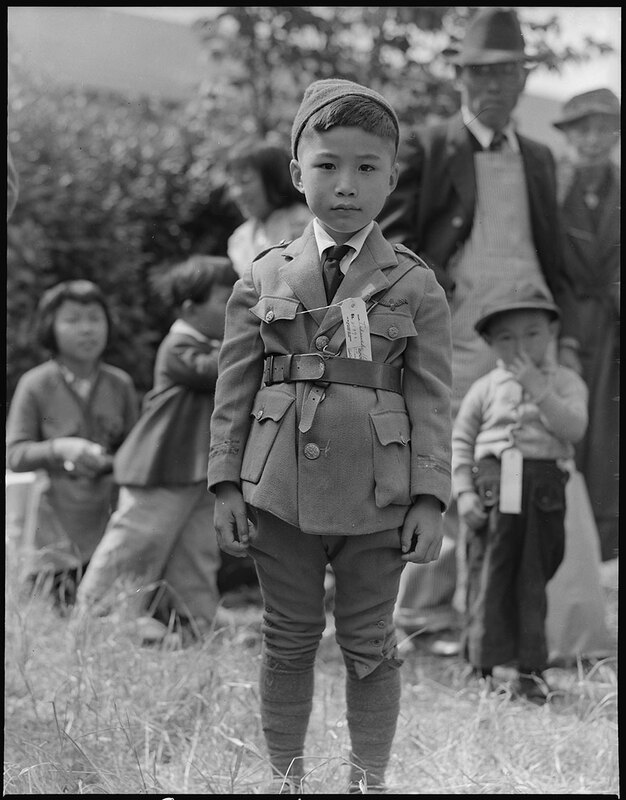 A complete record, by personal interview, is being made of every evacuee of Japanese ancestry at this War Relocation Authority center. The full caption for this photograph reads: San Francisco, California. 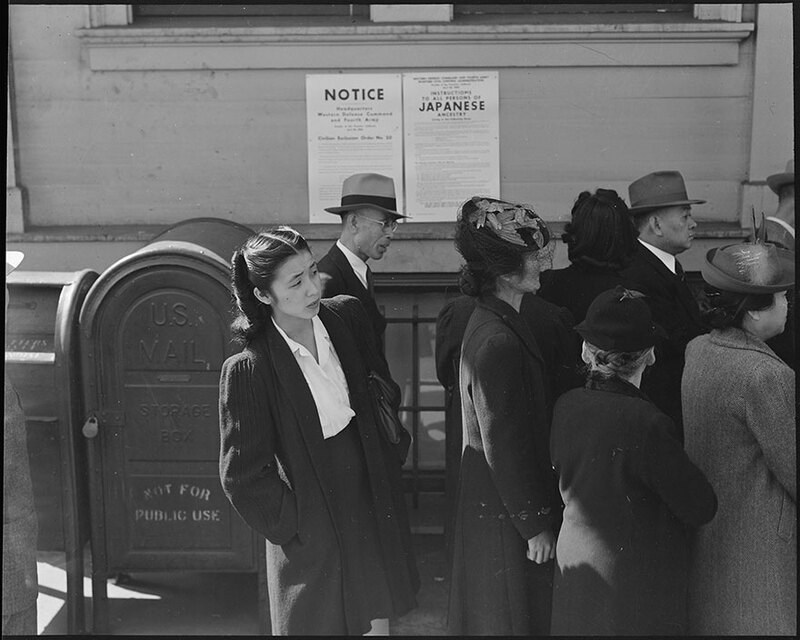 Residents of Japanese ancestry appear for registration prior to evacuation. Evacuees will be housed in War Relocation Authority centers for the duration. The full caption for this photograph reads: Manzanar Relocation Center, Manzanar, California. 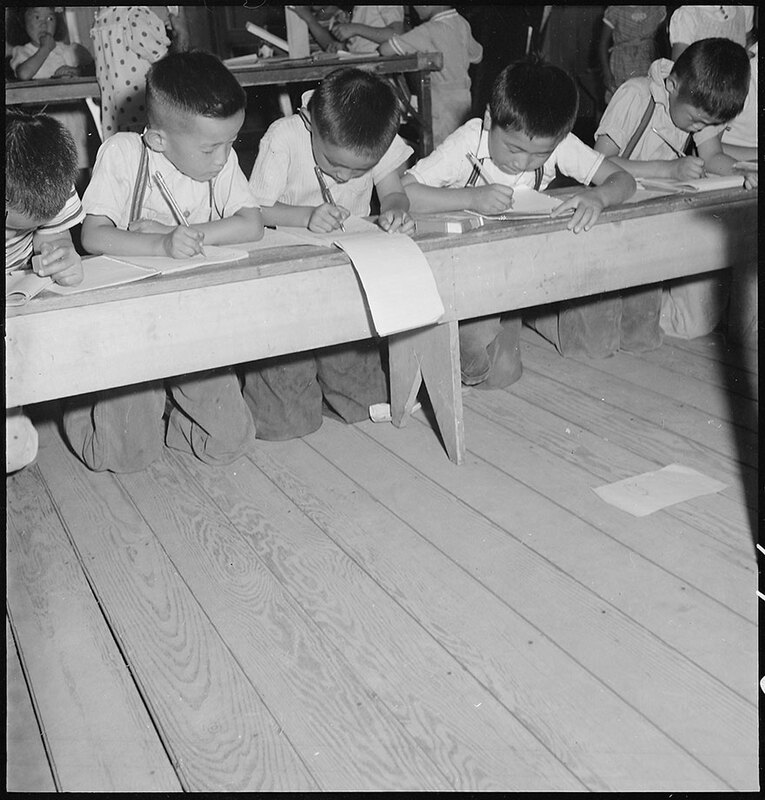 These young evacuees are attending the first elementary school at this War Relocation Authority center. There are six grades with volunteer teachers and voluntary attendance. 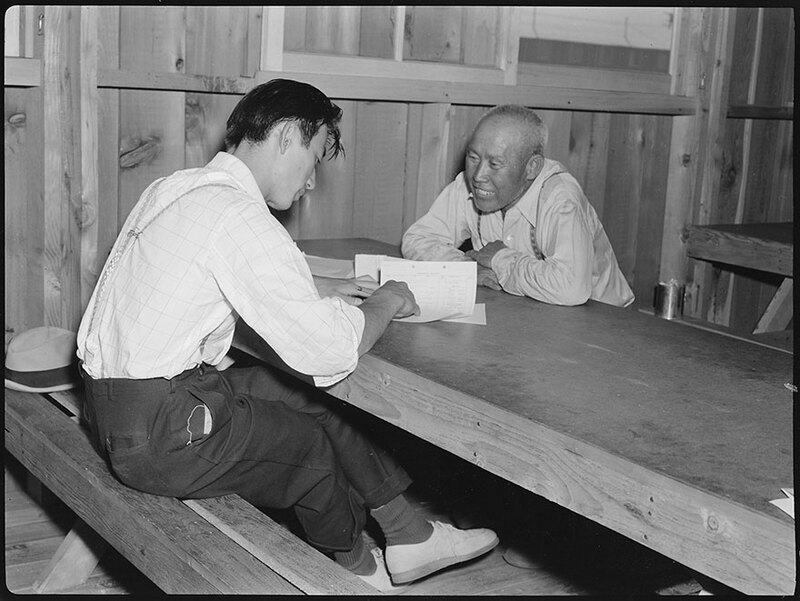 The full caption for this photograph reads: Manzanar Relocation Center, Manzanar, California. An elementary school with voluntary attendance has been established with volunteer evacuee teachers, most of whom are college graduates. No school equipment is as yet obtainable and available tables and benches are used.